On Thursday 2nd May over 50 students and workers in Cambridge came along to a debate between the Cambridge Marxist Discussion Group and the Cambridge Christian Union on the question of the world economic crisis. The discussion was opened by John Pickard, former editor of the British Marxist newspaper ‘Militant’ and author of ‘Behind the Myths: the Foundations of Judaism, Christianity and Islam’, who explained that the desperate economic situation faced by us in Britain, Europe and the world reflects a fundamentally rotten capitalist economic system. John said that this crisis is one of overproduction – i.e. caused by business and industry producing more commodities than can be absorbed profitably by the market – the product of which is bankruptcy and austerity. John also pointed out that this is a world crisis in which people across the globe find themselves suffering together under austerity and fighting against that tiny minority whose wealth has actually increased since 2008. John argued for a move away from a system based on a profit-driven, contradiction-ridden capitalist system, towards a society in which the main levers of the economy are owned, controlled and planned by working people in a democratic way. In this way the vast material, technical and intellectual resources of the world can be harnessed for the benefit of all. Our second speaker was Michael Schluter, founder of the Relationships Foundation and current CEO of Relationships Global. Michael explained that his study of biblical law demonstrated that relationships are the key to a healthy functioning society. Michael pointed to the breakdown between shareholders and company executives which led to irresponsibility on the part of the bosses. Michael also pointed out that the teachings of the Church abhor debt, and argued that a society less reliant upon debt is crucial for future progress. Michael pointed out that, on a fundamental level, it is human greed, selfishness and imperfection that allowed such a devastating economic crisis to take hold, and austerity is the price that we must now pay for that. Michael argued for the importance of strengthening our relationships with the people around us, and also with those people and institutions from which we benefit. In this way we are able to take some responsibility for the decisions taken in our name. It’s also vital that we recognise the inherent imperfections in all our relationships and ask forgiveness from God. The discussion was then opened to the floor with interesting contributions from both sides of the debate on questions of morality, the economy and the practicalities of changing society. 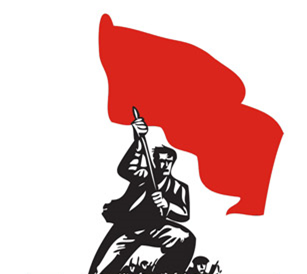 Marxists hold the position that morality is determined by the material conditions of society, not by abstract rules that allegedly stand above society and dictate down to it. Indeed the Church itself has repeatedly changed its position on what is and is not moral throughout its existence. The Christian argument that was put forward was that it is not possible to be moral without a belief in an afterlife. On the question of public ownership of the main levers of the economy there was a sharp division of opinion. Michael challenged John or anyone else to point to a planned economy that had been a success. John made reference to cooperatives in countries such as Nicaragua and argued that such models could work equally well when scaled up to a national and international level. Reference was also made to the economic advances made by Venezuela and the USSR under planned or partially planned economies. In response a challenge was made to Michael from the floor that asked why he thought simply asking the bosses and the bankers to build better relationships with the rest of the population would actually result in them doing so – the point being that we cannot simply appeal to the better nature of these people because their actions are dictated by their class circumstances, not by abstract morality. Michael maintained however that a reform of capitalism was still possible. Finally, the practicalities of changing society were discussed. Interestingly it was not those advocating a revolutionary transformation of society who were criticised for being impractical, but the position that capitalism could be reformed from within by asking the rich to be more “responsible” with their money that attracted criticism as utopian. 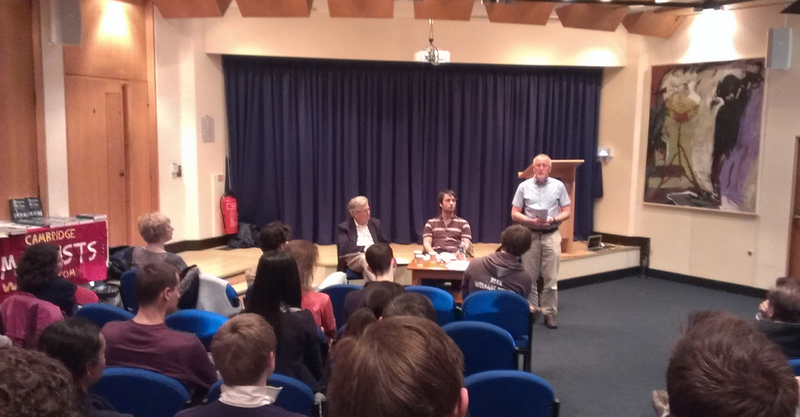 Thanks to everyone who came along to the debate and made it such a constructive and fraternal event. Both speakers were asked what they would recommend to read for anyone who would like to find out more about either Marxism or Christianity. John recommended ‘The Communist Manifesto’, while Michael recommended any one of the New Testament gospels.